Prime Minister Voreqe Bainimarama with Rev. Lepani Saqa of Kiuva, Bau during Methodist Church annual conference at Centenary Church on August 21, 2018. Photo: Ronald Kumar. Appointment of teachers to schools is done on merit, the Methodist Church has been told. 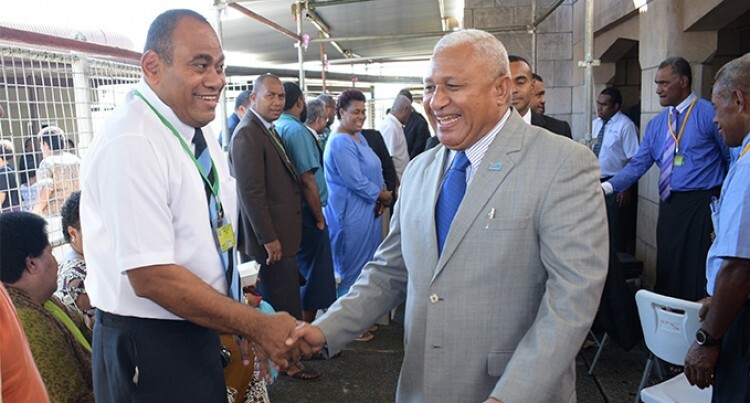 Prime Minister Voreqe Bainimarama said yesterday that it was not based on their religion. Speaking to delegates at the Bose ko Viti (annual conference) in Suva, Mr Bainimarama said Government was putting the right people with the right experience in the right positions to do the best possible job. “That’s different than the old way of thinking. We all remember that faith-based schools were once separated, and religious background was favoured over a person’s qualifications. “Teachers and Head Teachers needed to be from a certain ethnic background or follow a certain religion or denomination to teach at certain schools. But that’s not the case any longer,” he said. “Now, we are putting women and men who are best equipped to educate in the places where they can do the most good for Fiji and for Fijian students. If we have someone who has an exemplary qualification, who is committed to Fijian students and who has a proven record of excellence, we want them managing a school, regardless of their faith. “That means that yes; someone who is a Methodist can serve as head teacher at St. John’s College, which is a Catholic School. “That means that yes, someone who is Catholic can educate students at Makoi Muslim Primary, that means someone who is a Hindu is able to teach the students at Suva Methodist Primary, and that means that someone who is a Latter Day Saint can serve as the Principal at Assemblies of God School, so long as those people are qualified, so long as they have a passion for the education of our young people, and so long as they have the skill-set and have been appointed on merit”.